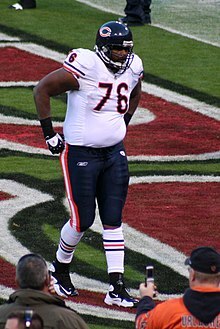 Orlando Lamar Pace (born November 4, 1975) is a former professional American football player who was an offensive tackle in the National Football League (NFL) for thirteen seasons. He played college football for Ohio State University, and was twice recognized as a unanimous All-American. He was drafted by the St. Louis Rams, first overall in the 1997 NFL Draft, and played professionally for the Rams for twelve years. Pace started all 16 regular season games eight times in his pro career, and blocked for three straight AP NFL MVPs (Kurt Warner in 1999, 2001; and Marshall Faulk in 2000). He was the cornerstone of a Rams offensive line that blocked for an offense that compiled more gross yards than any other team during his 12 years in St. Louis (50,770 in 12 seasons), finished second in completion percentage (61.8 percent) and fifth in touchdown passes (289) over that time. Under Pace's protection, the Rams' passing offense compiled more than 3,000 yards in all 12 of his NFL seasons, seven different quarterbacks eclipsed the 3,000-yard mark in a season, including three times surpassing the 4,000-yard mark, and blocked for seven 1,000-yard rushers. Pace started 154 games with the St. Louis Rams and Chicago Bears, with whom he played the final season of his career in 2009. A five-time All-Pro and seven-time Pro Bowl selection, Pace earned a Super Bowl ring with the Rams in Super Bowl XXXIV. Pace was elected to the College Football Hall of Fame in 2013 and the Pro Football Hall of Fame in 2016. Pace was born in Sandusky, Ohio. He was a two-sport athlete for the Sandusky Blue Streaks at Sandusky High School. He had a successful football career. He was named to the Parade magazine high school All-America team as an offensive lineman and the USA Today All-America team as a defensive lineman. Pace attended The Ohio State University, where he majored in business and played for the Ohio State Buckeyes football team from 1994 to 1996. He was only the second true freshman ever to start on opening day for the Buckeyes football team. He was a two-time consensus first-team All-American, and won the Outland Trophy in 1996 for the best college football interior lineman. He won the Lombardi Award for the best college lineman or linebacker in 1995 and 1996, becoming the only two-time winner of that award, and the most recent (through 2017) offensive lineman to be honored. He is one of only twelve players to have won both the Outland Trophy and the Lombardi Award. He and Dave Rimington are the only three-time winners in the Outland/Lombardi category. He was a finalist for the 1996 Heisman Trophy, finishing fourth in the voting, the highest finish for a lineman (offense or defense) since Hugh Green finished second in 1980. Pace also lined up at defensive tackle during some goal line situations during his junior year at Ohio State. Pace was so dominant that the term pancake block—referring to when an offensive lineman knocks a defender on his back—gained popularity at Ohio State due to his play. He was nicknamed "The Pancake Man." Several other college teams have been using the term since the 1980s, most notably Nebraska. In fact, the Ohio State Athletic Department distributed Orlando Pace pancake magnets as a promotion for his Heisman Trophy run. Pace did not allow a sack in his last two years at Ohio State. Pace finished 4th in the Heisman trophy in 1996, which was practically unheard of for an offensive lineman, and demonstrated his dominance at the college level. In 1999, Pace was selected as a starting offensive tackle by Sports Illustrated in their "NCAA Football All-Century Team". The other starting offensive tackle on that list was Bill Fralic. Pace was one of five Ohio State Buckeyes on Sport Illustrated's All-Century Team 85-man roster; the others being Jim Parker, Archie Griffin, Chris Spielman and Jack Tatum. In 2013, he was inducted into the College Football Hall of Fame. After Peyton Manning chose to skip the 1997 NFL Draft and return to Tennessee, Pace was considered to be the top candidate for the Jets′ selection at No. 1 in the draft. The Jets eventually traded their top pick to the Rams one day before the draft. Pace was picked by Rams as the first offensive lineman since Ron Yary in 1968 to be drafted first overall. After a three-week holdout, on August 15, 1997, Pace signed a seven-year $29.4 million contract that included a $6.3 million signing bonus. Pace played 13 games during the 1997 season, his rookie year. He made his first start against the Oakland Raiders on September 28, 1997 and started every game for the rest of the season. In 1998, Pace started 16 games at the left tackle position and was named Pro Bowl alternate. In the 1999 season, Pace played in 896 of 994 offensive plays and was selected to his first Pro Bowl. It was the first time that a Rams' offensive tackle was named to the Pro Bowl since Jackie Slater in 1990. Pace was also a First-team All-Pro for the Super Bowl winning Rams. In the 2000 season, Pace earned second consecutive Pro Bowl invitation, starting all 16 regular season games and 1 playoff game. Pace was anchor of offensive line that helped offense produce most passing yards in NFL history, playing in 1,006 of possible 1,013 offensive plays (99.3 percent), second highest total on offensive line. Pace was one of three Rams' offensive linemen (C Andy McCollum, RT Ryan Tucker) who were not penalized for holding. In 2001, Pace started every game for the fourth consecutive season. He played in 100 percent of offensive plays, joining Adam Timmerman as the only Rams to play in every offensive play. He started all three playoff contests, the St. Louis Rams claimed the NFC West title and advanced to Super Bowl XXXVI falling to New England Patriots, 20-17. He earned third consecutive Pro Bowl invitation. In 2002, despite missing six games due to injury (three to calf injury games 4-6; three to hamstring games 13-16), Pace earned his fourth consecutive Pro Bowl invitation. Pace had a lengthy holdout by reporting to camp on August 26, 2003, and signing a one-year deal as the Rams franchise player. The deal was worth $5.7 million. In 2003, Pace started all 16 regular season games and one playoff game, he helped the Rams' offense to rank second in the NFL with an average of 27.9 points a game. He earned a fifth consecutive Pro Bowl invitation as the Rams claimed their third NFC West title in five years. On September 5, 2004, Pace ended another holdout and signed the Rams' $7.02 million offer. It marked the second straight year Pace missed most or all of the preseason before signing his one-year tender. By designating Pace as a franchise player, the Rams were obligated to pay him the average salary of the five highest-paid offensive linemen in the NFL. Pace went on to start all 16 regular season games at left tackle and both playoff games. He was one of three linemen to start every game (C Andy McCollum, G Adam Timmerman) and blocked for an offense that ranked eighth in the NFL (third in the NFC) in first downs (321). Pace helped Rams convert 13-of-16 fourth down attempts, second highest fourth-down conversion percentage in the NFL (68.4%). He earned his sixth consecutive Pro Bowl invitation. Pace was a free agent in 2005 and explored the possibility of signing with another team. The Rams placed the franchise tag on Pace again. In March, he visited the Houston Texans. The problem for Pace and the Texans was that if they work out an agreement, the Texans would have had to agree with the Rams on a compensation package, which would be two first-round draft choices which the Rams would be entitled to under the franchise-player rules. However, the day before a deadline, the Pace accepted a seven-year, $52.9 million deal. The deal included $18 million in first-year salary and bonus. In 2005, Pace earned seventh consecutive Pro Bowl invitation, tying him for fourth in Rams history, behind Hall of Famer DT Merlin Olsen (14), Hall of Famer G Tom Mack (11), and LB Les Richter (8). That season, Pace started all 16 games at left tackle, joining C Andy McCollum and G Adam Timmerman as only Rams linemen to start every game. In 2006, Pace started the 8 games he appeared in until he left in the second quarter against the Seattle Seahawks on November 12, 2006 after he tore his triceps, ending his 2006 season. He was placed on Injured Reserve on November 14. Pace was injured during the Rams' 2007 season opener against the Carolina Panthers on September 9, 2007. Officials confirmed that Pace would be out for the entire 2007 season, severely jeopardizing the Rams' offense for the remainder of the season. In 2008, Pace played in and started 14 games, missing only two with an injury, compared to the 15 he missed in 2007 and the 8 he missed in 2006. However, the Rams struggled on the field and their head coach Scott Linehan was fired mid-season and the team fared little better under interim head coach Jim Haslett and the team finished 2-14. Dogged by injuries in recent seasons, Pace was released by the Rams on March 10, 2009, to save $6 million under the salary cap. Pace signed a three-year $15 million deal (with $6.1 million guaranteed), with the Chicago Bears on April 2, 2009. Pace started the first 11 games at left tackle in his lone season with the Bears in 2009 before sustaining a groin injury on November 29 in a loss to the Minnesota Vikings. He later finished the year as a reserve behind 2008 first-round draft pick Chris Williams. He was released on March 1, 2010. In his 13-year career, Pace was paid just over $75 million in salary and bonuses. Pace owned "Big O's Ltd" in his home town of Sandusky, Ohio. It was a family-friendly sports bar located on W. Perkins Avenue. Pace liked to make appearances at his restaurant, occasionally signing autographs for his hometown fans. Big O's Ltd has since been closed however. Pace was inducted into the Rose Bowl Hall of Fame on December 30, 2013, at the Pasadena Convention Center. Pace was a finalist in the 2015 Hall of Fame induction class and his second year of eligibility has made the final 15. On February 6, 2016, he was elected to the Pro Football Hall of Fame. ^ Eskenazi, Gerald (March 9, 1997). "With Manning Out of the Running, Pace Is the Jets' Man ... or Is He?". New York Times. ^ Eskenazi, Gerald (April 18, 1997). "Parcells and Jets Deal Quality for Quantity in Draft". New York Times. ^ Maske, Mark (3-15-2005).Washington Post Retrieved September 12, 2010. ^ (3-17-2005)Associated Press Retrieved September 12, 2010. ^ USA Today.com Retrieved September 12, 2010. ^ "2016 'NFL Honors' complete list of winners". NFL.com. Retrieved February 7, 2016. Wikimedia Commons has media related to Orlando Pace. This page was last edited on 3 February 2019, at 03:06 (UTC).